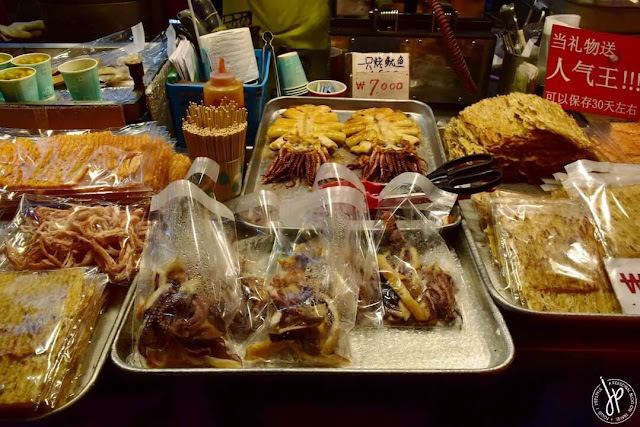 I had my first share of Korean street food during my first time in Seoul back in 2012. 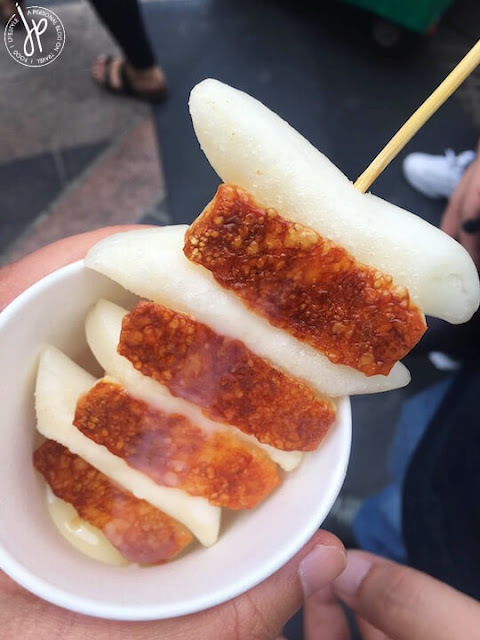 I remembered ordering a hotdog on stick which was coated with fried potatoes, and then skipping sausages and other tofu-like things soaked in hot broth. When I saw Kim Bok Joo biting and slurping all these tofu-like things with intense passion, I know I had to try them myself when I go back to Korea. A few months ago, we stayed in the heart of Myeongdong and every night, we had the chance to take in as much street food as we can. After shopping, we literally allotted two hours on the street so we can try the best Korean street food that’s within our budget. It’s nothing like Filipino street food because ours is way cheaper (and the cleanliness a bit questionable lol, but I do love them! ), but theirs is just a total feast for the eyes. Some will only cost you as little as KRW 1,000 (Php 43.50) while other delectable treats (like the flame torched scallops) will burn your pocket at KRW 15,000 (Php 652.50). That’s why to make the most out of your money, I’ll show you a list of Korean street food we’ve tried so far and what I honestly think about them. All of these cost no more than KRW 7,000 each. 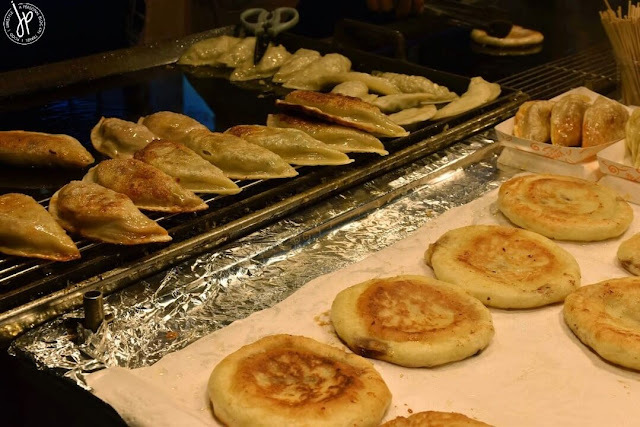 This sweet, Korean pancake is one of the most popular Korean street foods. It’s made out of milk, sugar, flour, and yeast and it’s usually filled with peanuts, cinnamon, and brown sugar. In some places, you’ll find this filled with green tea. We bought the original one with just brown sugar (or cinnamon lol), and it has just the right amount of sweetness. I suggest you eat Hotteok towards the end of your food trip as this can be too filling. 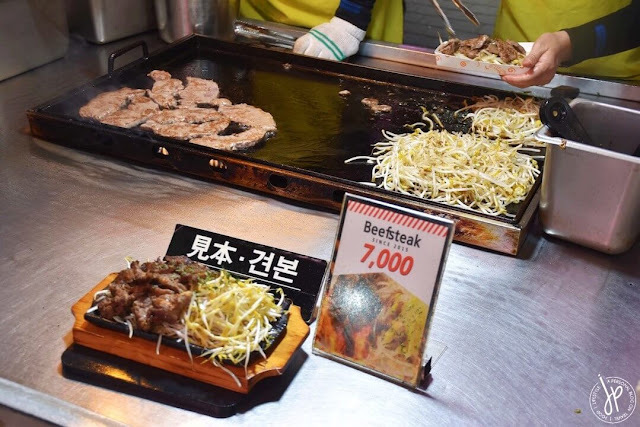 When it comes to meat recipes, the Koreans have mastered the art of cooking beef. The doneness of the steak lies between medium rare and well-done. You’re going to love this beefsteak if you’re as carnivorous as my husband. But for someone like me who finds it hard to digest beef, I find this ok. It tastes really good, though. 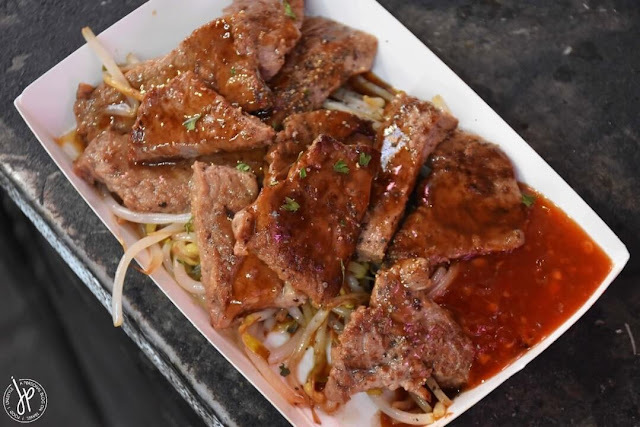 The bean sprouts balance the saltiness of the steak. Seafood, finally! I loooove having grilled seafood, especially when it’s paired with rice! Unfortunately, I had to stick with just the seafood here. The process of grilling the squid in Korea is different from the usual charcoal. The vendors use a “Mekbanseok” which are mineral rocks that are kept warm. The squid is put directly on top of the rocks and no visible rock particles are transferred to the seafood. 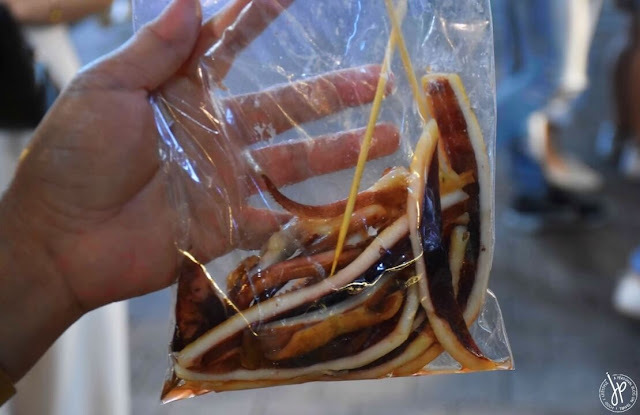 For easy consumption, the squid is sliced into thin pieces which you can poke with a stick. 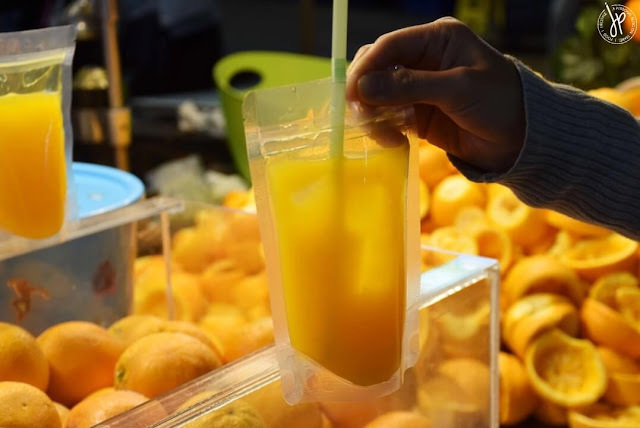 It remains hot even when packaged in plastic and you’ll find the sweet and salty juices oozing at the bottom of the package. 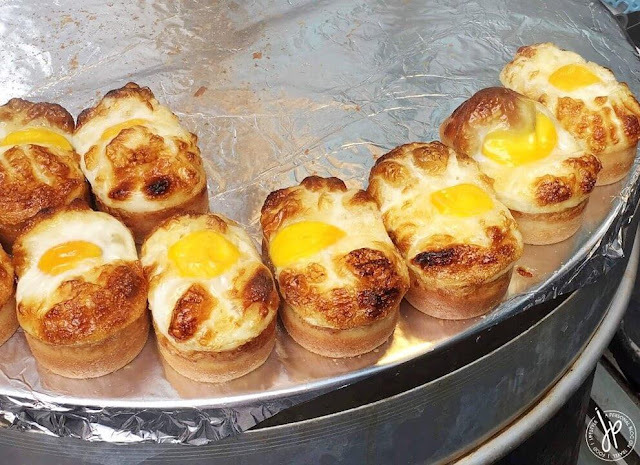 This mini, oblong loaf bread with whole egg can be found in many street food stalls in Myeongdong. It’s definitely lighter and fluffier than the Hotteok, but my taste buds didn’t find this one appealing. Maybe I was expecting a sweet taste out of it, considering the somehow caramelized egg on top. However, it was bland for my liking. Care for a fresh, fruit squeeze? This one is for those who love oranges. The juice is extracted right in front of you and then packaged in a doypack. I like this better than plastic or paper cups because it’s easier to hold and dispose. In all its form, filling, and shape, my go-to cheap yet yummy food when in Korea is Kimbap. Imagine my excitement when I can pick multiple flavors in just one payment! 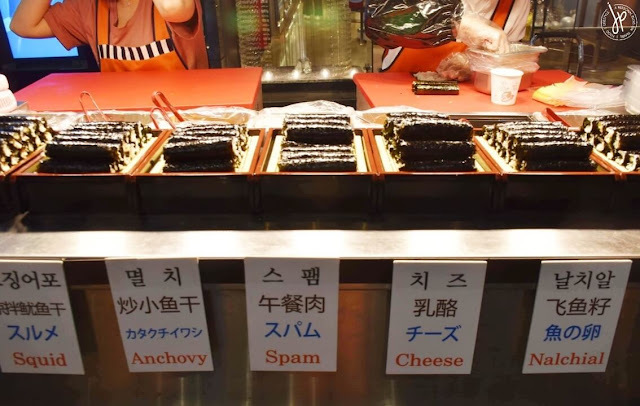 It’s essentially the Korean version of Japanese sushi or maki - only you may opt not to dip it in soy sauce as you can snack this one when you’re on-the-go. If my memory serves me right, the flavors I chose were spam, tuna, and spicy beef. Not sure which I liked best, but these mini Kimbaps found their way immediately into my tummy! This is the only street food on stick that my sister and husband bought twice (or thrice). Koreans cook their rice cakes in different ways (i.e. Tteokbokki) and pan frying these is one sumptuous way to do it. I’m not so sure, but I feel like they included cheese in between the rice cakes, which varies the flavor. If you feel like these are too bland, you can always dip them in sweet milk. So the weird, tofu-like thing that Kim Bok Joo was eating so vigorously is actually a fish cake. I first had this back in Busan and since then, it has been a favorite of mine. 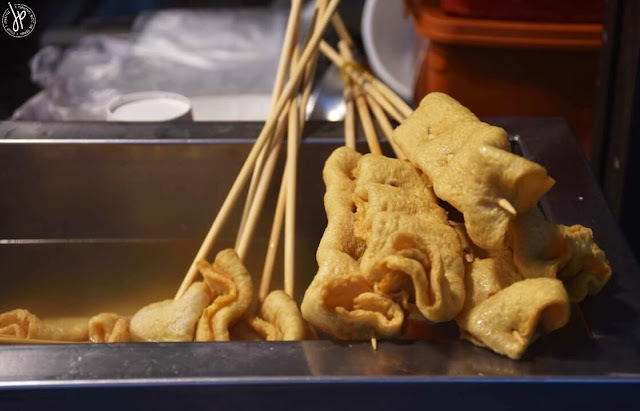 The taste is like a mixture of fishball and squid ball (which are popular Philippine street foods), but only the fish cake is cooked in a much healthier way. These Odeng or Eomuk are cooked through boiling in a broth mixture. Fish cakes are usually skewered on a wooden stick and when you order one, you will be given a cup of its broth (which I enjoy gulping after a couple of bites). These Odeng are filling, too so my advice is to eat only one serving if you still want to explore a variety of Korean street foods in Myeongdong. A food trip experience isn’t complete without dessert! And my choice is the affordable yet eye-catching sundae. Twirling an ice cream is a talent - one that requires patience and practice - but the vendors make it seem so easy. 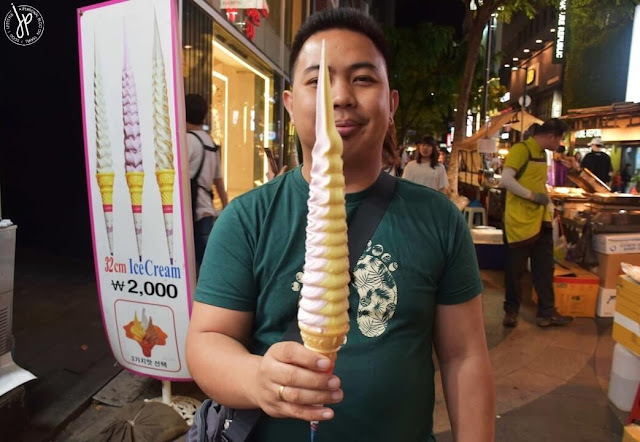 I’ve had my fair share of successful ice cream twirling myself whenever I buy an ice cream sundae at Family Mart, but I could never do something this tall! Not only is this pleasing to the eyes, but these taste good, too. You can choose from multiple flavors like chocolate, vanilla, green tea and more and you can choose to have two flavors at once. I got mine in strawberry and banana flavors. This isn’t technically found in the streets of Myeongdong, but it’s one of the must-try snacks when you exit Myeongdong subway station. 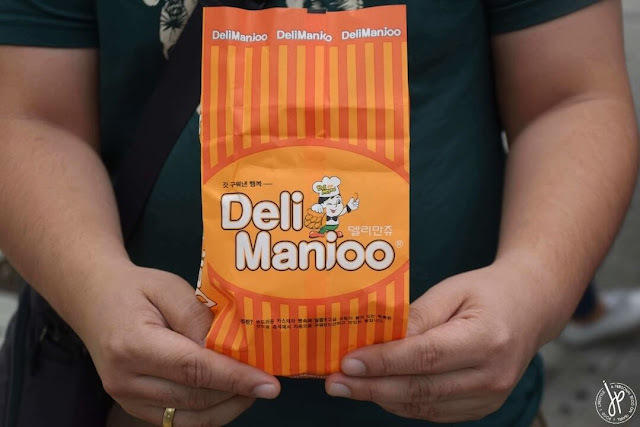 Upon passing through the underground shopping mall, your nostrils will be filled with the delectable smell of freshly baked goodies called Deli Manjoo. 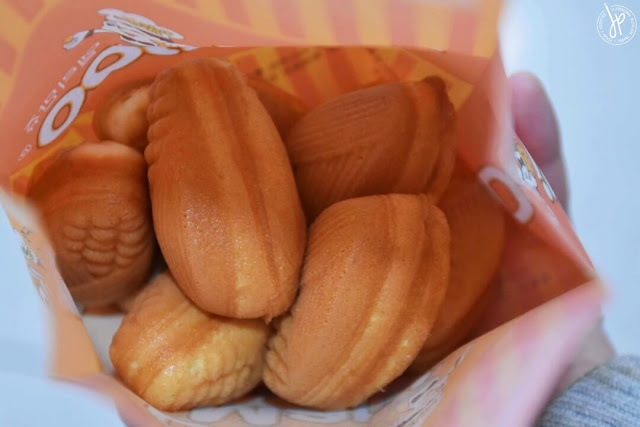 These are shaped like dumplings and inside of each piece is an egg-custard filling that’s not to sweet and not too thick. 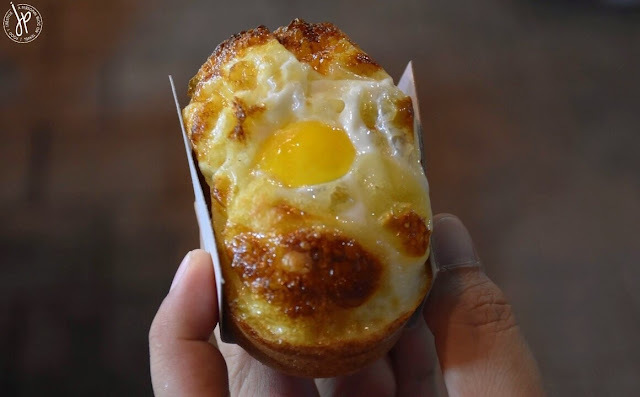 The bread itself is soft and thin so right after one bite, expect an explosion of custard that oozes right out of the Deli Manjoo! These are only made upon ordering so you’ll get a fresh batch of goodies everytime. Remember to eat them right away while they’re still piping hot! How about you? 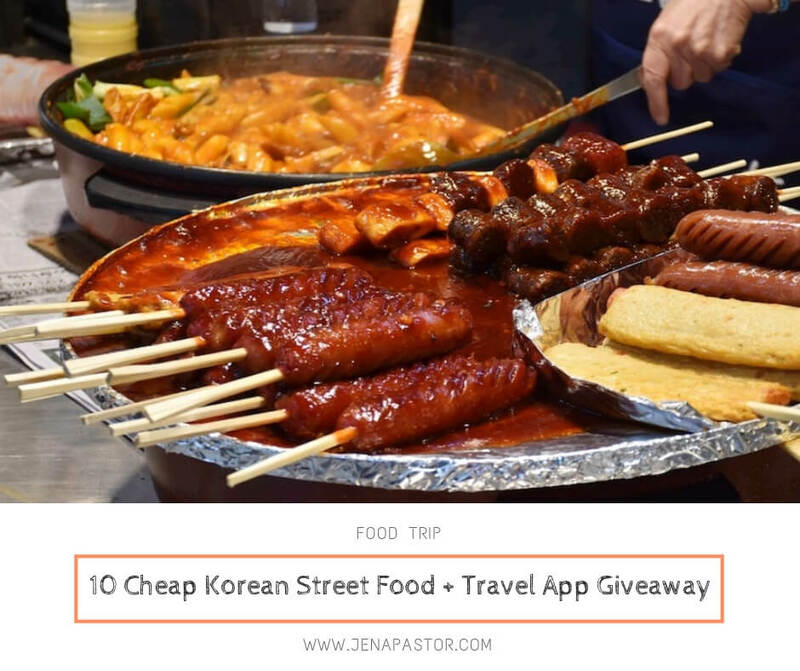 What’s your favorite Korean street food? To celebrate a year of breakthroughs, I am giving away 10 annual subscriptions to GPSmyCity.com. 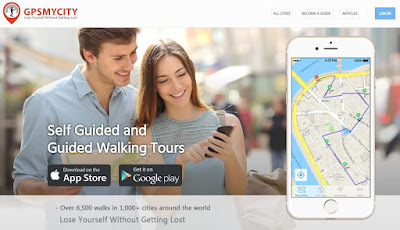 GPSmyCity is a travel app that provides self-guided city walks in over 1,000 cities around the world! Each city walk features the most popular attractions, including a detailed route map, which makes it easy for you to visit these popular destinations on foot at your own pace and at your own convenience. 1. Follow all or any of my social media channels (Facebook, Twitter, and Instagram). 2. Leave a comment on this post by letting me know what’s your ultimate dream destination for 2019. 3. Once you’re done with steps 1 and 2, email me your full name and social media accounts at jenapastoronline@gmail.com so I can check. I will also reach out to you via email in case you win. Only one entry per person. The giveaway will run from October 9 until October 27, 2018 and I will be picking out 10 winners via Random.org. Good luck! Norway, Finland and Iceland. I want to see the Northern Lights! 1.France - to climb and witness the beauty of Eiffel Tower! 2.Japan - to experience the cherry blossom season! 3.New Zealand - to explore the Hobbiton! It has always been France - Paris, Nice, and its coastal area.